C Spire Archives · Stop the Cap! For residents of 10 Mississippi communities, an alternative broadband option is now available delivering up to 120/50 Mbps speed with no data caps or throttling for a flat $50 a month, taxes and fees included. “C Spire 5G Internet” is as described, except it doesn’t use the official 5G standard and will require the installation of a “dinner plate”-sized antenna on one’s home to get the service. C Spire is using an 802.11 variant with equipment developed by Mimosa and Siklu, leveraging C Spire’s existing 8,400 route miles of fiber infrastructure to extend service wirelessly to each customer without the cost of wiring a fiber optic cable to the home. Siklu’s EtherHaul products work in conjunction with its point-to-point and point-to-multipoint radios that operate in the 60 and 70-80 GHz millimeter wave bands. 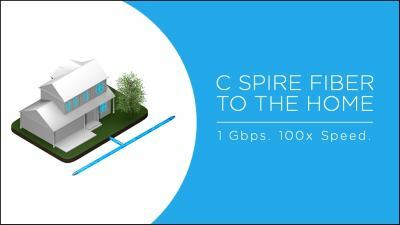 Because of the vast amount of spectrum available on these uncongested frequencies, C Spire can provide connections up to 10 Gbps from each small cell site. 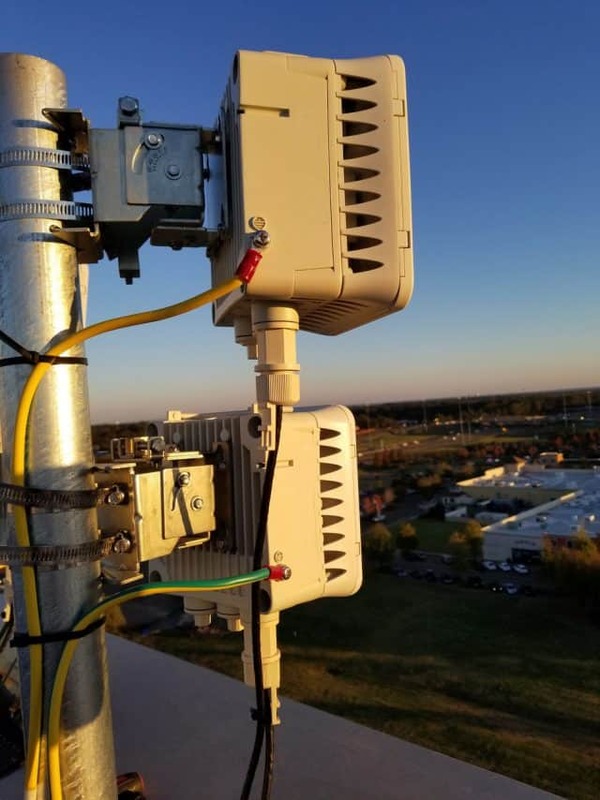 C Spire is using Siklu’s EH-600 mmWave backhaul equipment for its fixed wireless internet service in Mississippi. Mimosa supplies short-range MicroPoP architectures and in limited tower deployments including Mimosa A5 and A5c access devices, Mimosa C5 client devices, and Mimosa N5-360 beamforming antennas. C Spire said it is quickly working to introduce the service in “dozens” of markets in Mississippi, in addition to its earlier plans to offer fixed wireless to over 90,000 locations across its service area. The “5G” fixed wireless service being introduced in Mississippi is not the same as C Spire’s earlier fixed wireless initiative. Customers report wireless speeds are within a reasonable range of what is advertised, but antenna placement can be critical to get the best speed. It isn’t known how many customers are currently sharing each small cell site, and C Spire has protected itself with a contract clause allowing it to begin data caps, usage based billing, or targeted suspensions for customers deemed to be consuming too much data if network congestion becomes a problem. Mississippi is broadband-challenged because many of its rural locations are populated with some of the country’s poorest citizens. AT&T, the state’s largest phone company, has shown little interest expanding fiber into many of these areas, especially in northern Mississippi, and the state’s cable companies include Cable One, notorious for being expensive and data-capped. As a result, the state is ranked 49th out of 50 for broadband availability. C Spire is a regional mobile provider — the sixth largest in the country — and directly provides its own cell service in Memphis, Tenn., Mississippi, Alabama, and the Florida Panhandle. C Spire, an independent wireless company providing service in the southern United States is partnering with electric utility Entergy to jointly construct a new fiber optic network in remote sections of Mississippi to manage an electric smart grid and fiber broadband service. C Spire will own and build the network, with Entergy contributing construction costs, according to C Spire vice president of government relations Ben Moncrief. The partnership grants Entergy leasing rights to use the fiber optic network to develop smart grid technology for rural Mississippi electric customers. Five individual fiber routes will be build, each with a capacity of 144 or more strands of fiber. Entergy will have exclusive use of its own fiber strands, but C Spire will get most of the capacity to power its backhaul facilities, including its network of cell towers, and eventually deploy the network for commercial and institutional users, with the possibility of expanding service to home and small businesses customers if there is adequate demand. The fiber network will be uncharacteristically placed in some of the most rural parts of the state’s push to redevelop its rural economy to support digital businesses. C Spire itself has been in transition over the last five years, diversifying its core cellular business into fiber to the home broadband, phone, and television service targeting underserved, smaller communities across the state. “A robust broadband infrastructure is critical to the success of our efforts to move Mississippi forward by growing the economy, fostering innovation, creating job opportunities and improving the quality of life for all our residents,” said Hu Meena, CEO of C Spire. 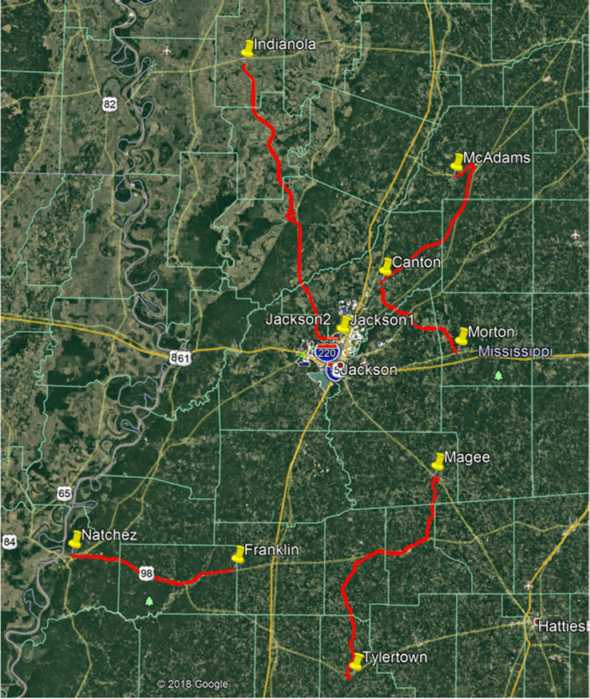 Delta: 92 miles of fiber through Sunflower, Humphreys, Madison and Hinds counties and near the cities of Indianola, Inverness, Isola, Belzoni, Silver City, Yazoo City, Bentonia, Flora and Jackson. North: 51 miles in Attala, Leake and Madison counties, including the communities of McAdams, Kosciusko and Canton. Central: 33 miles in Madison, Rankin and Scott counties and near the towns of Canton, Sand Hill and Morton. South: 77 miles passing through Simpson, Jefferson Davis, Lawrence and Walthall counties and near the towns of Magee, Prentiss, Silver Creek, Monticello and Tylertown. Southwest: 49 miles in Franklin and Adams counties near Bude, Meadville, Roxie, Natchez and Eddiceton. C Spire got the idea to collaborate with the electric utility after the Mississippi Public Service Commission inquired if Entergy’s plans to build a fiber optic smart grid network could also be used to develop improved broadband service for rural Mississippi. Entergy and C Spire decided to collaborate on the project to deliver both services over the same network. The sleepy deep south isn’t often a battleground for an all-out broadband competition war, but Ridgeland, Miss.-based C Spire, a regional cell phone company with fiber broadband aspirations, has gotten too big for its britches and Comcast is preparing to demonstrate its size and resources can run even a home state provider into the ground. 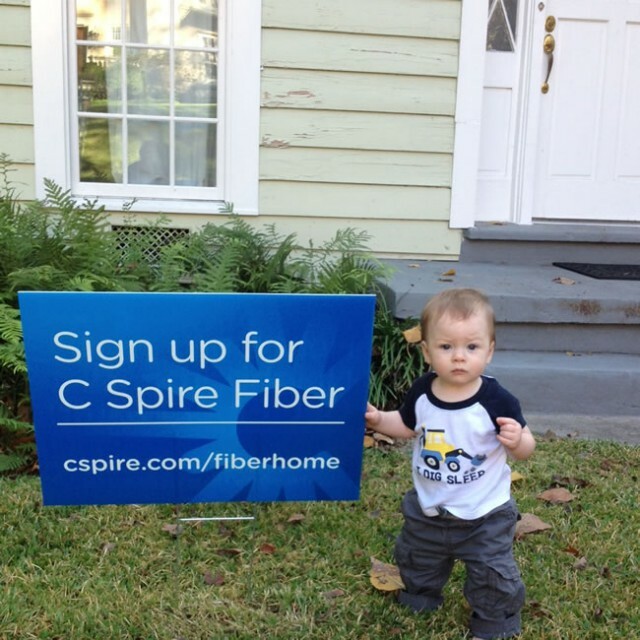 C Spire is building a statewide fiber-to-the-home network, city by city, on its pre-existing fiber backbone which extends to C Spire’s cell towers across the Magnolia State. As the fiber network expands, talk of doing something in a “Mississippi Minute” will be a thing of the past as C Spire prepares to deliver gigabit broadband speeds far in excess of what competitors like Comcast, AT&T and Cable One are prepared to offer. Communities already on the construction list include: Batesville, Clinton, Corinth, Hattiesburg, Horn Lake, McComb, Quitman, Ridgeland and Starkville. But C Spire’s network caught the attention of Comcast earlier this month when it announced Jackson, the state capital, was going to get fiber service. C Spire is following Google Fiber’s model, attempting to get enough residents in a neighborhood to pre-register with a refundable $10 deposit. Online pre-registration for the service began in Jackson last month, and several hundred residents applied even before the fiber network expansion was announced, ready to tell Comcast to take a hike. Jackson neighborhoods that reach sign-up levels set by C Spire will be the first to get the new generation of fiber services, the company says. C Spire’s plans could cost Comcast a significant number of cable customers across Mississippi, and it isn’t taking that lightly. Departing from its usual tradition of focusing new technology on large northeastern cities, Comcast will begin saturating Jackson with its Wi-Fi hotspot service, starting with 200 public hotspots slated for launch before the end of this year. The company only had a handful of Wi-Fi hotspots in Jackson before. Jackson will also get significant cable service upgrades, including the introduction of a new “smart home” service, a cloud-based service integrating Comcast’s cable, Internet, and home-security. Kagan also expects Comcast will cut prices to undercut C Spire. That would be consistent with Comcast’s customer retention policies that dramatically lower rates for customers threatening to leave. 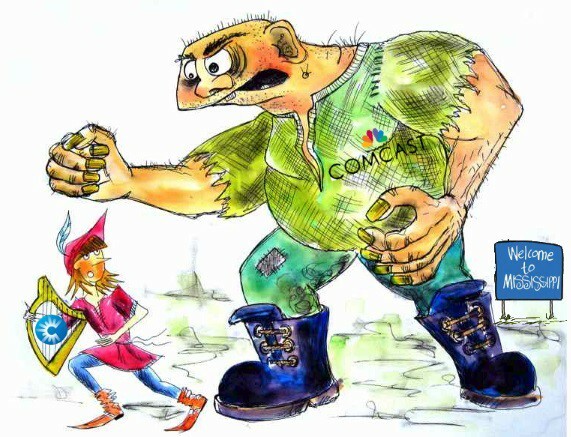 Rate-cutting will benefit consumers, but if Comcast engages in below-cost predatory pricing, those savings will be short-lived. If that battle becomes cut-throat, C Spire’s fiber aspirations may end up nothing more than pipe dreams if the company retreats, deciding it cannot survive in a battle with Comcast, the Giant of all cable companies. AT&T couldn’t have gotten a better deal for itself if it tried. Mississippi state officials that awarded AT&T a 10-year State Master Contract, compelling the majority of state government offices to do business only with AT&T, have just given the phone company an early two-year extension without allowing for any public discussion or competitive bidding. In 2005, when the contract with AT&T was first signed, it was unlikely most government offices, schools, and libraries would be able to find any bidder other than AT&T. The state contract spells out a series of requirements that critics contend were tailor-written with the full knowledge only AT&T could offer the full menu of required services. Nearly 10 years later, and more than a year before the contract was up for renewal, the state suddenly granted AT&T a two-year contract extension, potentially exposing taxpayers to overpriced, taxpayer-funded broadband services. Interested members of the public who want to examine the state contract for telecommunications with AT&T have run headlong into a roadblock erected by a Hinds County judge who ruled it was off-limits for public inspection and has since been sealed under court order. To this day, only government customers of Mississippi’s Department of Information Technology Services, the agency in charge of the state government’s broadband, are allowed to see the document. The state contract comes at a significant cost to taxpayers if Marvin Adams’ figures are correct. Adams, who works for the Columbia School District, suspects a lot of money has been frittered away because of the lack of competitive bidding. Only the state’s schools and libraries have the option of either securing a contract with AT&T or requesting bids from competitors like Ridgeland-based C-Spire, which supplies fiber and wireless connectivity. Adams says AT&T’s contract with the state costs taxpayers $5 per Mbps. But AT&T also charges a “transport circuit charge” of between $10-45 per Mbps. Adams said his colleagues have seen competitive bids averaging $6 per Mbps and the transport circuit charge is included in that price. The Mississippi Watchdog delivered the understatement of the year when it called AT&T’s contract with Mississippi “lucrative.” Attempts to modify the contract have met with fierce opposition in Jackson, the state capital. Senate Bill 2741, a modest measure that would have compelled school districts to seek competitive bids before signing a multi-year contract with a provider, died in committee earlier this year. 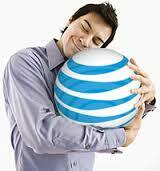 AT&T has close political ties in several southern states. The company co-authored an article with Gov. Phil Bryant and donated at least $42,500 to his various campaigns for political office. In 2012, Bryant signed a bill into law removing most of Mississippi’s remaining regulatory authority over AT&T. Next door in Louisiana, Gov. Bobby Jindal also maintains close ties with AT&T. The company has funneled more than $250,000 to his wife’s charitable foundation – the Supriya Jindal Foundation for Louisiana’s Children, which also takes substantial contributions from oil and chemical companies, the insurance industry and defense contractors. The New York Times reported back in 2011 that telecom companies like AT&T were increasingly contributing to politically connected charities they could use in campaigns to influence legislation and regulation. Companies can write off their unlimited charitable giving while politicians take credit for the work done by the non-profit groups while also quietly understanding exactly where the money is coming from. 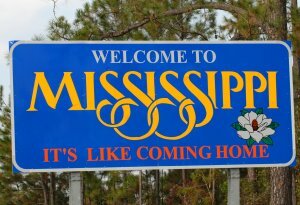 C Spire has announced the nine Mississippi cities that will be finalists for the nation’s first and only statewide 1Gbps broadband fiber to the home Internet service. 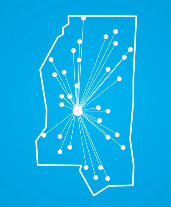 The nine communities participating in the first phase of the gigabit fiber broadband initiative include: Batesville, Clinton, Corinth, Hattiesburg, Horn Lake, McComb, Quitman, Ridgeland and Starkville. These cities and towns were among 33 municipalities that submitted formal applications late last month. Competing cities developed aggressive campaigns featuring rallies and town hall meetings, local celebrations, door-to-door canvassing, mobilization of neighborhood groups and homeowner organizations, dedicated websites, social media campaigns and even stadium and freeway billboard advertisements to get C Spire’s attention. C Spire also announced pricing for its Internet and related digital television and home phone services. 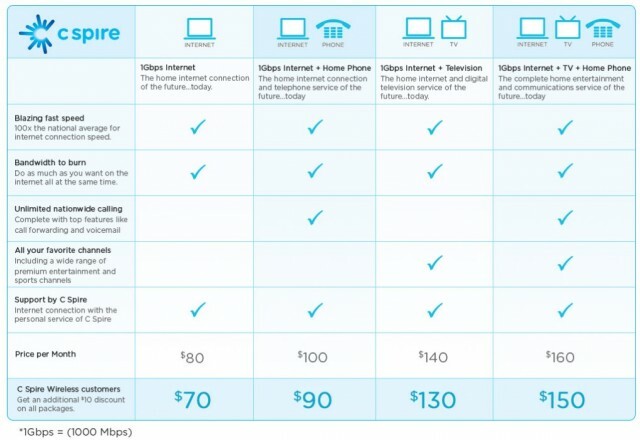 Pricing for 1Gbps Internet access will be $80 a month, $100 a month for combined Internet and home phone, $140 a month for Internet and digital TV and $160 a month for the entire package. C Spire Wireless customers will receive an extra $10 monthly discount on all packages. The finalist cities were selected by a C Spire review panel that considered factors like proximity to the company’s fiber optic infrastructure, community mobilization capabilities and incentives to speed up the construction process and reduce overall costs. The nine finalists for C Spire’s gigabit broadband network. Meena said C Spire plans to continue working with the cities that were not selected in the preliminary round and will share best practices and improvements that promise to make the process easier, faster and better for later challenges. “We want to ensure that all of our communities remain actively engaged in the process and keep the demand and excitement alive for upcoming phases,” he said. The finalist communities will next compete to see which can pre-register the most homeowners in designated fiber neighborhoods. Those that reach their targets will get fiber service first. As soon as neighborhoods reach their percentage goals in an individual city, C Spire plans to begin construction in those areas – so there is a possibility that work could start in more than one community at the same time, said Gregg Logan, senior vice president of C Spire Fiber. Residents will be asked to make a $10 refundable deposit and provide credit card information when they pre-register. The website also will feature detailed, interactive maps of neighborhoods in cities showing progress each one is making toward turning their fiberhood “green” and qualifying for build out of the service. Logan said C Spire hopes to start turning up 1 Gig service in the first C Spire Fiber neighborhoods by the middle of next year.